Make Life Happy: CAN'T LOSE. I was about ready to break up with 2016 for a while there and mooooove on but I have been filled with a lot of momentum this week and it really hit me that in 4 months we reach 2017 [!!!] I can handle that! With the chilly weather the past couple of days, I've become really excited for the cozy months ahead! I'm putting my best foot forward and giving the rest of the year all I've got! I threw this print together because I feel like it's the realistic success recipe of champions! You know - the humane, "heck no, you are not an olympian", Usain Bolt-wannabe type of champion. AKA me, myself and I. 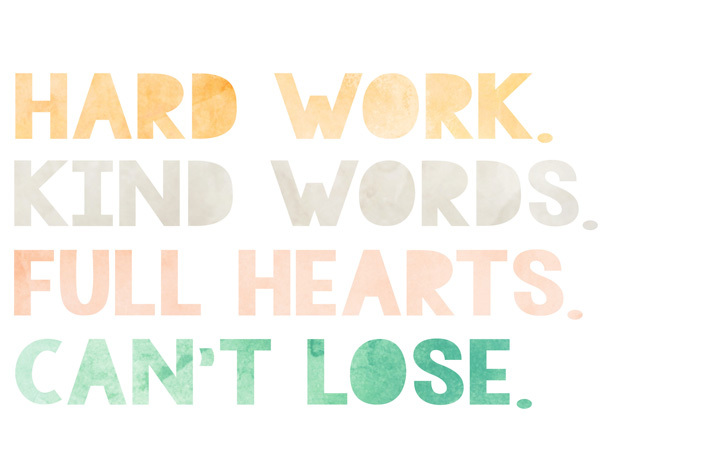 Work + kindness + gratitude = can't lose. Again, this is premature, but I have been putting a lot of work into some projects that are brewing for 2017 and man am I ever ready to get them going! Just you wait, they're gonna be good guys! Gonna be good.